May 9, 2013: Today, the Walt Disney Company announced the release of two special promotions for the late summer vacation season! 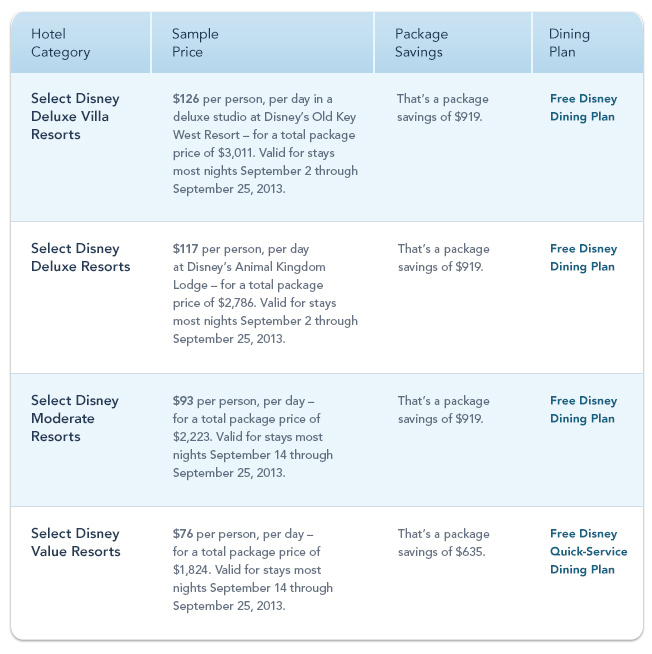 In the first announcement, the long awaited Free Disney Dining Plan was offered as an incentive to travel to Walt Disney World for most days between September 2nd – 25th, 2013. Depending on the category of resort you are staying at, you will be eligible for either the Quick Service dining plan or the regular Disney Dining Plan, also known as “plus Dining”. The image below shows potential savings that are available under this promotion. Note: In this image, some of the dates are listed as September 14-25. This appears to be a mistake in the graphic. The actual dates are September 2nd – 25th, 2013. 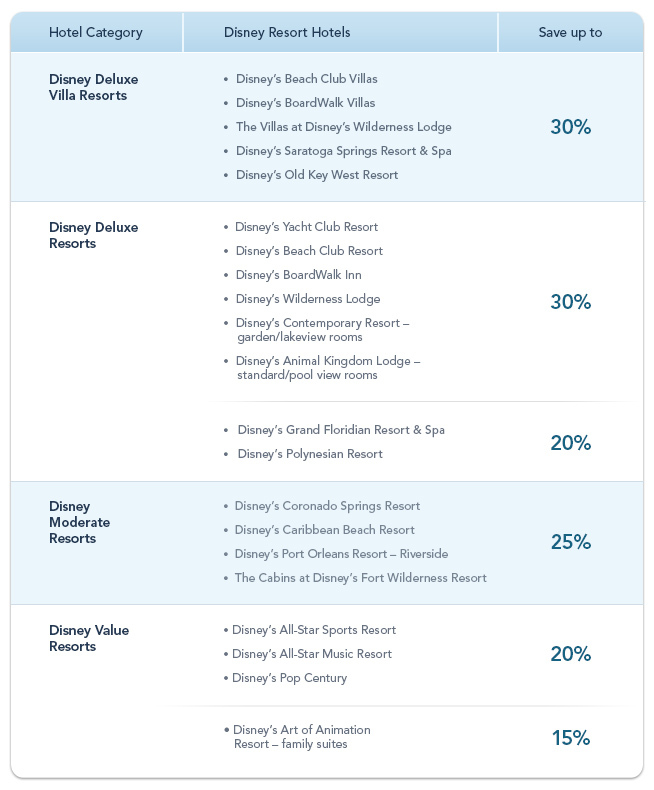 In addition to the coveted Free Dining Plan, Disney also released a special late summer Room offer, with discounts of up to 30% off select resorts. This special runs from August 15th – September 28th, which may be of big help for vacationers who wish to get a trip in before school returns to session! The list of resorts is limited also, and the discount depends on the category of the resort. Please take a look at this graphic for specific savings at the resorts listed. As a reminder, I am an Authorized Disney Travel Planner for Pixie Vacations, and I would love to be able to help you plan your next Disney vacation! If you would like for me to work up a quote, please click on the quote request link, fill in the required information, and I’ll be in touch! Thanks for stopping by, have a great day! Alice in Wonderland is a ride located in the Fantasyland section of Disneyland Park. This attraction, which is of the mold of The Many Adventures of Winnie the Pooh and Snow White’s Scary Adventures, is a ride where you enter and examine some of the key points to the story. As you go down the rabbit hole, you’ll encounter all sorts of characters from the story, including the Queen of Hearts! Let me tell you, she sounds just as bad on this ride as she is in the movies and story! One thing of interest about this attraction is that it is the only attraction that features scenes both indoors and outdoors. Do you enjoy Alice in Wonderland? Let me know in the comments, and thanks for stopping by!